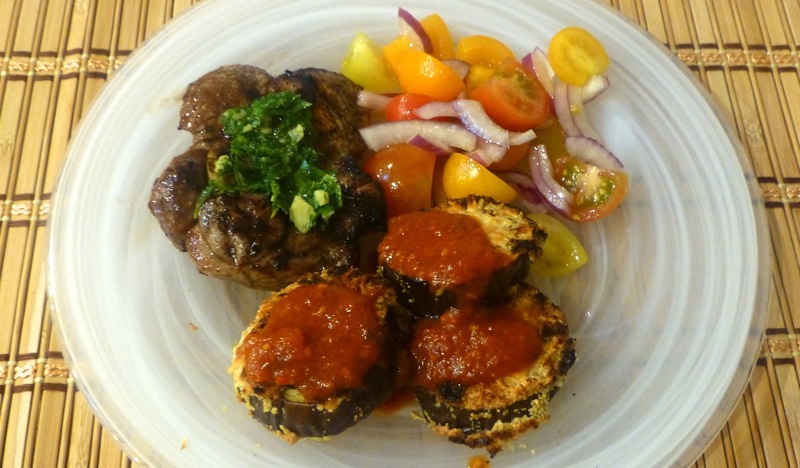 And … this recipe also had a Tomato and Onion Salad with Crispy Baked Eggplant Dippers. I normally try to make only one new recipe for dinner but this evening I made three of them. Whew! Talk about coordination! Fortunately for me, all three recipes turned out great. 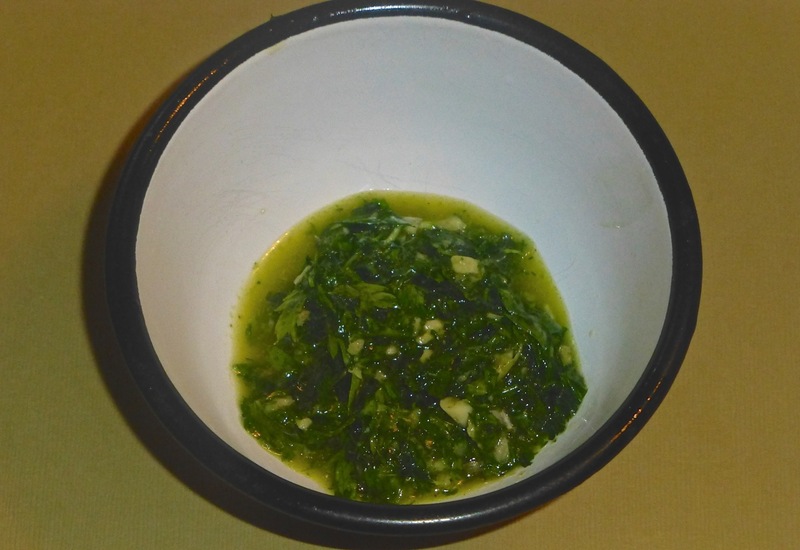 I started with the ingredients for the Herb and Garlic Sauce. 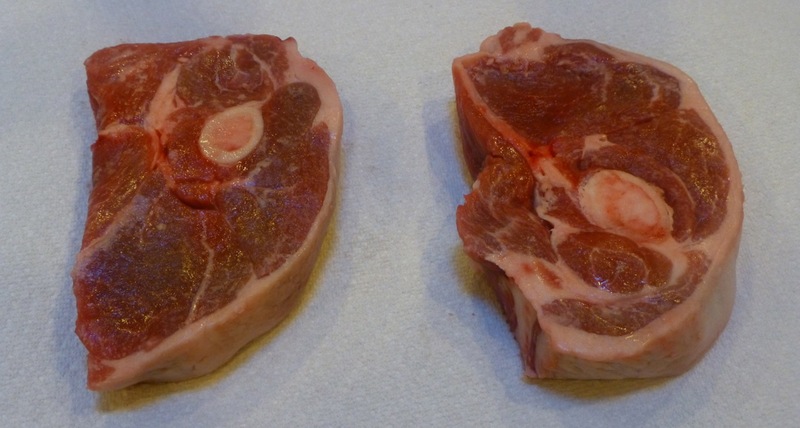 The original recipe calls for 20 lamb chops and I only used two so I adjusted the recipe accordingly. 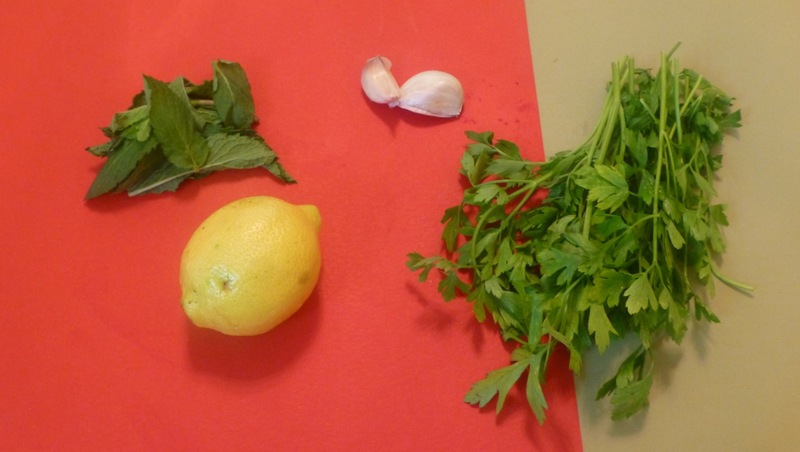 Add the parsley and mint leaves to your food processor or blender, followed by the garlic, olive oil and lemon juice. Process these ingredients until you have a slightly coarse sauce then add salt and pepper to taste. Mix again and taste it, adjusting the seasonings as you see fit. Put the sauce in a small bowl and set this aside until ready to use. 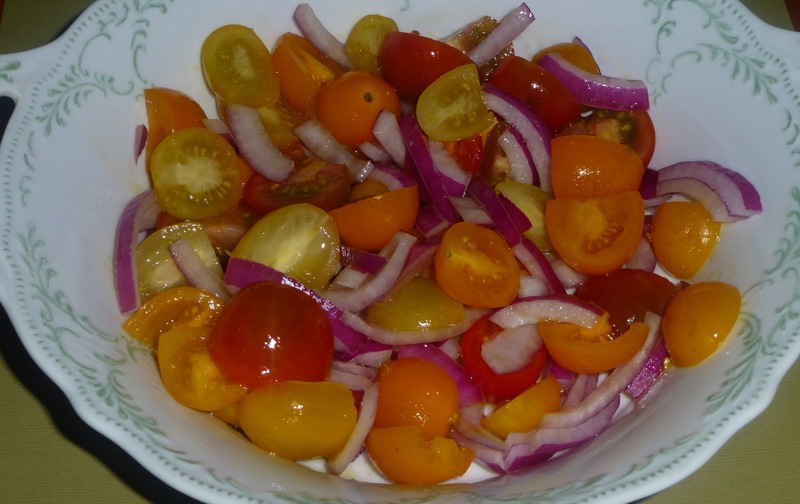 Next we’ll work on the Tomato and Onion Salad. Here are the ingredients — so simple and easy. Add all the salad ingredients into a big salad plate and toss it all together. Next we’ll work on the lamb chops. Again, I only bought two of them – one for me and one for hubby. You’ll be trimming off the fat then drying them on paper towels. 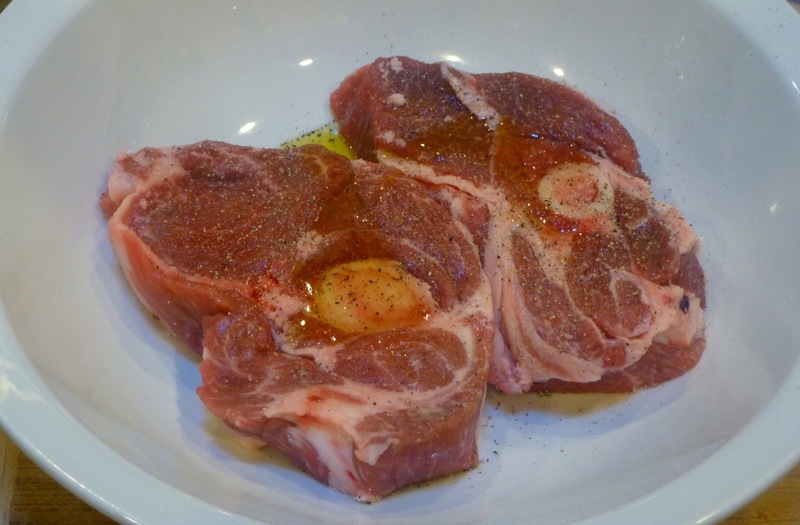 Next, pour the olive oil over them and rub it in the chops. Season them with salt and pepper. Heat your outdoor grill or your stovetop nice and hot. I like mine cooked well (no pink in the middle). The original recipe says you’ll be cooking them for 2 minutes on each side if you want them cooked medium so I doubled that time and they came out just fine. 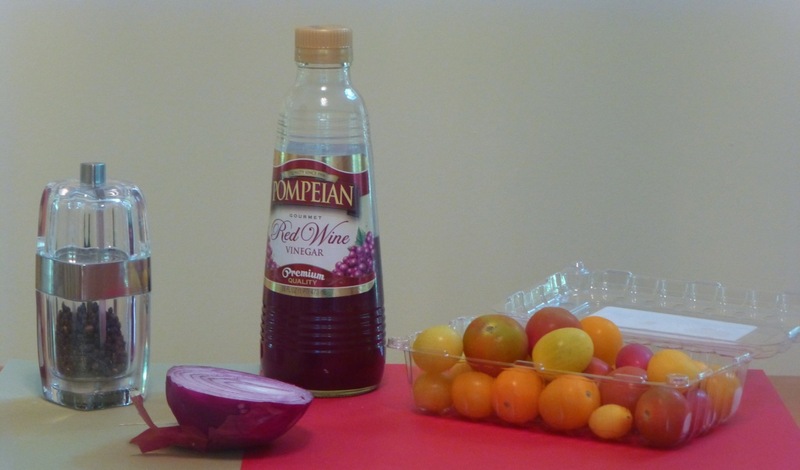 Thanks to My Little Expat Kitchen for these two recipes. She has a wonderful blog with many new recipes to try and this one is truly paleo!